JEFFERSON CITY • The city of St. Louis’ single largest source of general revenue would be phased out over 10 years under a measure approved by a Senate committee Thursday. Anyone who lives or works in the city of St. Louis or Kansas City must pay the 1 percent tax. In St. Louis, the tax generates one-third of the city’s general revenue, a total of $185 million last year. It pays for city services such as police and fire departments, park maintenance and street repair. Sen. Kurt Schaefer, R-Columbia, who is running for attorney general this year, sponsored the measure. He says the tax is unconstitutional based on a recent Supreme Court decision in Maryland because a credit for income taxes paid to other states is not provided. City residents last approved the tax in 2011, an election forced by a Rex Sinquefield-backed proposition that bars the creation of any new municipal earnings taxes in Missouri. 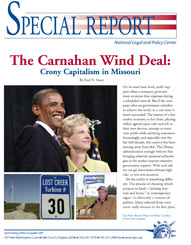 St. Louis and Kansas City voters must reauthorize the tax every five years. If voters ever fail to pass the tax, it would be phased out over 10 years. 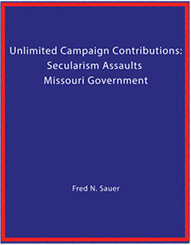 Schaefer has received $750,000 from Sinquefield, a retired investor and the state’s No. 1 political donor, in his quest for the attorney general’s office. 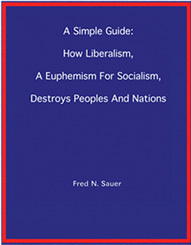 Here is a copy of the open letter that accompanied each book. It will give you some very keen insight into the problems St. Louis County would inherit from a merger with the city of St. Louis. 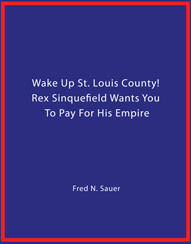 Has Rex Sinquefield paid you $750,000 to bankrupt St. Louis City and then merge it into St. Louis County? There is no way that St. Louis County should bear the extravagances and bad management of St. Louis City! Shouldn’t you tell us how you are going to replace 30%, or $150 million of the City’s revenues? 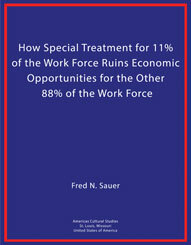 What government do you know that could replace 30% of its revenue? Are you a Sinq-o-phant (someone whose integrity has been neutered by receiving massive contributions from Sinquefield)? The City’s taxes are $1,242 per citizen vs. the County’s $449 per citizen. The City’s are 2.8 times greater than the County’s. The City’s total debt is about $1,900,000,000, or $5,967 per citizen vs. the County’s $617,934,308 total debt, or $617 per citizen. Thus, the City’s debt is almost 10 times greater per citizen than the County’s debt. (96,160 + 94,738 + 118,468) / 3, or $103,122. The County’s salary and fringe benefits in the 3 major classifications average (84,671 + 42,140 + 52,630) / 3, or $59,813. The City’s average is 1.7 times greater than the County’s average. The average wages in Missouri are $43,610. The City has 48 citizens for every employee (6,703). The County has 248 citizens for every employee (4,031). Thus, the City has almost 5 times the amount of employees per citizen than the County! And these employees all make the 1.7 times greater City average salary and fringes of $103,122 vs. the County’s $59,813. Decrease the salary and fringes of 692 City employees or 10.3% of 6,703 employees to the County average salary and fringes of $59,813. Decrease the salary and fringes of 3,464 employees or 51% of 6,703 employees to the County average salary and fringes of $59,813. The City has annual debt service of about $77,000,000 on runway 11/29 at Lambert Field which should have never been built! So Kurt, what you are doing proves that it is essential that Missourians throw out of office anybody who has received outsized contributions from Sinquefield!